Reading this, I have learned that I return to the pointer tool too often, by habit. Or maybe because this way I won’t draw anything by accident. In fact, I am still looking for a place where I can only use the pointer tool. Are you trying to set Visio so that ONLY the Pointer Tool can be used? That is, disable the other tools? Or have I misunderstood? I am using e.g. the rectangle tool, and I haven’t needed the pointer tool yet. Where would I really need the pointer tool ? I find the Pointer tool works better for moving shapes around, copying them, etc. You can work fast without accidentally drawing something (ie: a rectangle) or editing vertices, etc. One of your shortcuts confuses me. Why would I Alt-F-S instead of Ctrl+S? Is there a difference? This is helpful though, I did not know you could select pointer or text with a shortcut. (embarrassed smile…) I’ve been using the Alt+F+S for so long, I didn’t even notice the Ctrl+S, very silly of me! I think I just liked the way Alt + F + S corresponds to File > Save so nicely. Also, Alt + F + A works for File > Save As, so the similarity of the two got put into the same corner of my brain. Hey great summary of useful shortcuts! The one I simply can not find that would save just ludicrous amounts of time is how to cycle through pages (or sheets in Excel-speak) within a single drawing – I know the SHIFT+F4 dialog box one but that’s much too clumsy to actually use. Do you know such a beast? Mark Nelson = The Man! It shows you how to use code to create a drop-down combo box that helps you to navigate mutli-page drawings. It requires VBA code in your drawing, but might nevertheless be useful for your projects. One shortcut that I find very useful in both Visio and PowerPoint is CTRL-D to duplicate a selection. I hate that if I want multiple copies and use CTRL-V,V,V… to paste several times, they are all on top of one another, whereas CTRL-D duplicates at a small offset to the right and down from the original or subsequent duplicate in a nicely spaced diagonal line. I too am an “ALT” user, F,S; F,A; F,P and F,V just come naturally. Shame that some of these combinations and others such as Excel’s ALT-E,S,V no longer work in 2007. Thanks for this very helpful post, a few useful and not widely known combinations here for the unusual animal that is Visio. Incidentally, the shortcut using CTRL-SHIFT and mouse keys to zoom in only doubles/halves below 400% – if the resulting zoom is above that it goes in steps of 200% instead (*in 2007 at least, I no longer have an older install here to test). So you can go from 199 to 398 to 598, or from 201 to 401 to 601. F4 is really great for “repeating the last action”. So you can Ctrl+Drag a copy of a shape, then hit F4 F4 F4 F4 to get four more copies at the same spacing as your first drag! How to “knudge” a wall in smaller increments? It seems to move it in minimum 1/4inch or even 1/16″ but I can never get it to stop on EVEN 4ft-9″. It is always 4′-9 1/16 of 4-8 15/16 ? Any way to adjust the Shift+arrow key to allow an even dimension? I cant find this functionality anywhere. Can you elaborate? is there a keyboard shortcut to insert a picture from a file? I have found references to it but can’t actually find one. This would be a big help! Ctrl + w closes the current window in just about every program (including Visio), but you mention it as zooming to view the whole page. Is there another shortcut for that? Ctrl + W does a “zoom fit” in all versions of Visio, *until* Visio 2010. Now Ctrl + W closes the current window, which is a shock for Visio freaks! In Visio 2010, Ctrl + Shift + W does the zoom-fit, and Ctrl + W closes the window. Ctrl + F4 closes individual drawing windows in Visio, analogous to Alt + F5 closing applications windows. A keyboard shortcut for insert image, hmmm. I couldn’t find one. In Visio 2007: Alt + I, P, F.
In Visio 2010: Alt + N, P.
Do you have a tutorial on the alt chords for 10? That would be awesome! So many things I was unaware of! Now to break the habit of the old long way eh? This will make my job so much easier! I very much appreciate the tips and such that you have informed me of! this shortcuts is a whole lot of help. 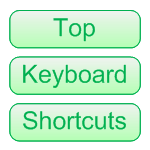 with these shortcuts and my keyboard macros, doing simple things in the computer would be easier. Hit the Alt key in Visio 2010, then look for the little letters next to each command in the Ribbon. That’s all there is too it! I’m a two-handed user looking to become a one-handed user. Thanks for the shortcuts and for making them so printer friendly. A lot of manual writers could do with lessons from you! I agree with Robert. This kind of visual (pun intended) tutorial makes things so much easier to learn. Cheers! I’ve been waited years for a list like this!! Shortcuts can save your life (and patience if you get them right) sometimes. Brilliant post! Is there a way to make the wheel of the mouse pan (found the zoom setting) without keys the way non-Microsoft graphics programs do? In other words can I pan without having to hold the CTR-SHIFT (why would you set it up to need this anyway)? Does anyone know of a way to quickly enter todays date in Visio? In Word you can use alt+shift+D but it doesn’t work in Visio. I have to do this all the time and would love to find a shortcut. p.s. 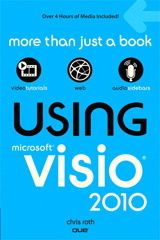 Bought your Using Microsoft Visio 2010 book yesterday, enjoying that too. Visio 2010 changed the shortcut for Zoom Whole Page. In previous versions it was Ctrl + W. In 2010, that closes the file! So in Visio 2010, you need to press Ctrl + SHIFT to zoom to whole page. It’s a dangerous habit that takes a week to modify. I’ll edit the article text too. Thanks for the nice words re: the book, Neil! hi i would like to know as much as possible about working on visio i am still new to this and it takes me ages to do my work any help ? Hi! THanks for the great list..
Is it possible to some use of the extra buttons on some mice? eg button 4&5 on an mx518..
I’m sure the extra mouse buttons can be used, but I’m not sure that it is up to Visio. Some mice buttons are used for page-forward and page-back, especially in browsers. Those probably function similarly in Visio. Sometimes there is mouse-driver software that lets you specify the functions, per-application. I think that often-times, the extra mouse buttons simply execute keyboard shortcut commands like page forward/backward or page-up/down. Thanks for these tips, I’ve been using Visio for sometime now, and was learning a few shortcuts. Then I decided to google some ‘tips and shortcuts’ for Visio, and Boom, this page was the result. I have Visio 2007, and I haven’t used it in three years (semi-retired). Built some process charts on Monday and Tuesday and the zooming and scrolling were killing me. When I came up for air, I used my searched engine to find “keyboard shortcuts” for Visio. MSFT was useless. Shame on them. But there you were! There is a place in heaven for you, Visio Guy. Many thanks for sharing. Now if you could only help me with line jumps (just kidding. Not your problem). You are a kind soul. You can also select multiple shapes and still use the short cuts. Very useful! Enjoy. Super-cool, Bill! I have never seen those two before!